Tigers are Endangered. Over the last hundred years the global wild tiger population has dropped 97%. With as few as 3,200 wild tigers left, bold and immediate action is needed. In 2010 at the Tiger Summit in St Petersburg, the 13 tiger range countries committed to the most ambitious and visionary species conservation goal ever set: TX2 – to double wild tiger numbers by 2022, the next Year of the Tiger. WWF is a major driving force behind TX2. The wild tiger population has dropped 97% over the last hundred years. With as few as 3200 tigers remaining in the wild tiger range governments agreed that to ensure a future for tigers drastic conservation action was required, so they committed to the most ambitious and visionary species conservation goal ever set: TX2 – to double wild tigers by 2022. Tigers are part of our planet’s natural heritage, a symbol of Earth’s biodiversity. They are a key species, crucial for the integrity of the ecosystems in which they live. As toppredators, they keep populations of prey species in check, which in turn maintains the balance between herbivores and the vegetation upon which they feed. In short, whentigers thrive, the whole ecosystem thrives. This in turn provides important financial, cultural and spiritual benefits for local communities who live with or near tigers. These ecosystems provide livelihood opportunities and ecological services, e.g. water and food , to millions of people throughout Asia. 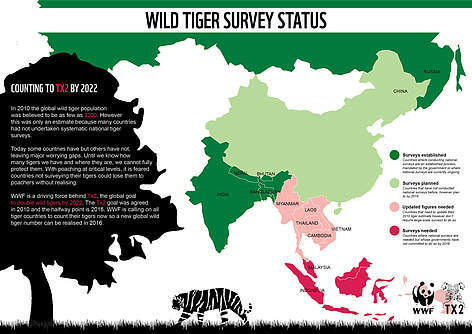 The wild tiger population can be used as a barometer for the health of the whole ecosystem. Also in countries like Nepal and India, wild tigers are a major attraction, drawing tourists to national parks and wildlife reserves and generating real economic and social benefits for local rural communities. In short: save tigers and save so much more. What is the time frame for TX2? TX2 is a 12 year goal: 2010 – 2022, from the last Year of the Tiger to the next. Straddling the border between northeastern China and the Russian Far East, this landscape comprises forests of Korean Pine and Mongolian oak, which provide an important habitat for the Amur tiger and its prey as well as livelihood for the local economy. Illegal logging poses a major threat to the tigers. WWF is working to increase wild tiger numbers by establishing a contiguous, well-protected, well-managed habitat, including cross-border protected areas.